This system optimizer currently includes 30+ tools to supercharge your PC's performance, and more than 200 tweaks to customize Windows to your liking, and improve its performance. New features in ver2 has 30+ tools: includes a spyware detective, email checker, icon manager, fast emailer, comprehensive backup tool for outlook & files-folders. 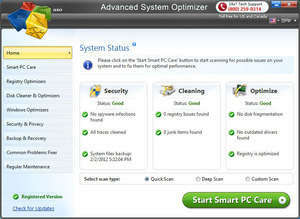 With Advanced System Optimizer, you can back up Registry and restore it if it is damaged by a virus attack. The system cleaner removes junk and obsolete files from the system; files that are often missed by the system uninstaller, defrag, and scandisk programs. Advanced System Optimizer 3.0 is a shareware program and can be used as a demo to try the software until the free trial period has ended. A full version of the program is available after the trial period ends. For security reasons, you should also check out the Advanced System Optimizer download at LO4D.com which includes virus and malware tests. Additional screenshots of this application download may be available, too. 4.17 out of 5 based on 6 ratings.